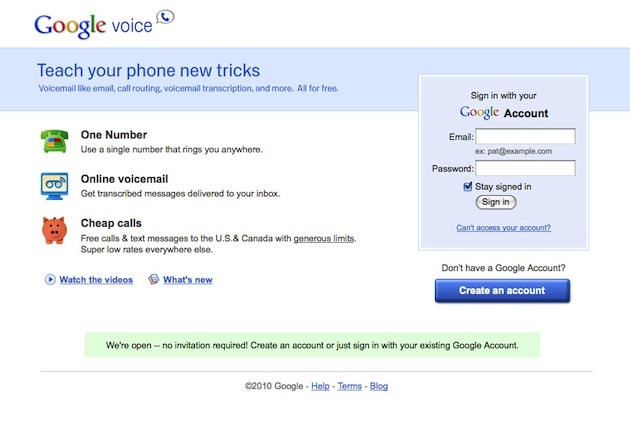 Known as GrandCentral upon its launch in 2006, Google Voice till now was an invite only service. Not any more. Google has announced today that Google Voice is now open to all in the U.S after immense popularity among the one million exclusive users. The service (available only in America) acts as a unified phone number allowing users to make free calls to the U.S and Canada, free text messaging, voice mail that can be checked by e-mail and lots more. A great service for hassle free multi tasking using only one phone number, Google Voice works great on all Android based phones. iPone users however can not enjoy the facility as Apple had barred Google Voice iPhone app from its app store last year resulting in the rivalry that still exists between the two giants. Check the video below to get the idea what Google voice is.